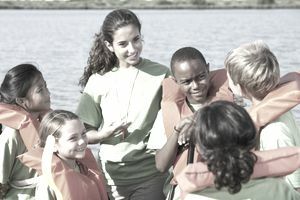 Camp counselors provide guidance, oversee activities for campers, and perform many other valuable functions on the job. Summer camps look for applicants who love working with kids, enjoy outdoor activities, have strong interpersonal skills, and excellent communication skills. Be sure to highlight your credentials in your resume and cover letters, as well as during job interviews. While some summer camps offer part-time positions, employment opportunities exist for full-time counselors as well. There are also other positions to consider if you're interested in spending the summer working at a camp. During an interview for a camp counselor position you may be asked various types of interview questions, as your interviewer will want to make sure that you're a good fit for both the job and camp culture. Learn how to prepare for an interview and arm yourself for success by reviewing the following list of specific interview questions. To prepare for your interview, review the job posting and other information you can find that lists the job requirements. Also review your resume and be prepared to discuss and highlight any experiences you have had that demonstrate your ability to meet those requirements. This especially helps with behavioral and situational interview questions. Because many people interviewing for camp counselor jobs are high school and college students with limited work experience, it's perfectly acceptable to include relevant experiences from school or other activities in your interview answers. Before the interview, research the camp for which you are interviewing. Carefully review the camp's website and other information written elsewhere online. Get a feel for the camp’s mission, the structure of the camp, the population of campers you would be working with, and the camp culture. Camp counselor interviews may include a number of types of questions. You'll find that many are common interview questions that apply to any positions, such as questions about your employment history, education, and your skills and qualifications for the job. You may also be asked questions about yourself, including queries about your personality and work style. Expect some of your interview questions to be behavioral. Behavioral interview questions ask you to explain how you dealt with past experiences. For a camp counselor interview, many behavioral interview questions will be about how you have handled conflict or issues that have come up with similar groups of children, peers, or coworkers in the past. You will likely also be asked situational interview questions. These are similar to behavioral interview questions, in that they ask you about different work experiences. However, situational interview questions concern how you would handle a future scenario related to your job as a counselor. For example, an interviewer might ask how you would handle a difficult situation with a camper. The following specific questions, sorted by category, will go a long way toward getting you prepared for many of the interview questions the camp administrators have planned for you. These questions are designed to determine whether you are a good fit for a summer job as a counselor. What made you want to be a camp counselor? Did you attend camp as a child? What did you like about it? What did you dislike? Employers will also want to know about your experience working with children. If you don't have formal work experience, mention babysitting, volunteering, or any other relevant experience with children. With what age groups do you have experience working? What are the top three qualities everyone who works with children must have to succeed? What sorts of activities would you do with a group of children ages 5-6? Do you hope to have a career working with children? Hiring managers ask behavioral interview questions as a way to discover how you would act in a particular situation. Explain a time when you had a conflict with a friend, coworker, or employer. Who was involved? What was the conflict? What was the outcome? Tell me about a time that you helped resolve a particularly difficult issue with a child. Give an example of a time that you changed a child’s emotions from frustration or sadness to happiness. Tell me about a time (at work or school) when you acted as a leader for a group of people. Name a type of activity you would do with children of this age group. Tell me about a time when you put the needs of another (or others) ahead of your own. Who was the person? What was the situation and how did it go? The interviewer asks these types of questions to determine how you would handle situations that may arise in your job as a counselor, if you were to be hired. What would you do if one of your campers refused to do an activity with the rest of the group? What would you do if it was raining and you had a group of twenty campers to entertain? How would you handle a child who was misbehaving and not following instructions? What would you do if a parent was angry with you for the way you handled a situation with their child? Imagine one of your campers is homesick and wants to go home. What would you do? Take the time to learn as much as you can about the camp before you go to the interview, so you're comfortable responding to questions about why you're a match for the job. Why would you be a good fit for our camp? What made you decide to interview for our camp rather than another? Work through the questions and focus on brief, yet informative answers. Work in any applicable personal stories and relevant accomplishments of which you are proud, and which can help you come across as a confident, capable, and experienced candidate for hire.